Thanks so much for the feed back, and we are glad someone noticed that! They are, in fact, on their own adventures, testing tech in the warehouse of a dungeon. Glad you enjoyed it! We definitely feel the need for some refinement, level generation of this type has been a hurdle of ours for a while. We hope to supplement the backtracking with more points of interest and hostiles. Thank you for your feedback! Thank you for your feed back, we apologize but we are unsure of the emotion you mean to convey by ":0"
Thanks for your feedback! 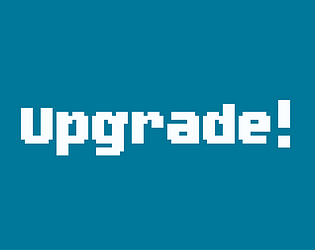 We have plans for refining the level generation (this is the first time we successfully got one up and running!) Glad you enjoyed it! The controls were tight. The overall feel of the game was easy, understandable, and fun. Thanks for your feedback! Glad you enjoyed it! Nice game with cool music, instruction in game will be great. Movement seems to be stuck sometimes and player keep moving without a key pressed. Thanks for your feedback! Be on the look out for an updated version in the near future. We will be looking into the movement issue, but it may be lag on your end(internet or itch page itself). The instructions on the game page helped clarify things. I loved the item that fixed the sound, and the shooting felt pretty good too. Solid game! We cut it super close to the deadline and weren't able to add it into the game heh! That is my favorite item as well! Glad you enjoyed it! I am not sure if I was missing something but there seemed to be no wincon and overall no clear objective. I figured out to pretty much shoot everything but nothing particularly posed a challenge and I am not sure if I could die. I liked the art and the music was nice but got a little repetitive. A few additional varied enemies would have been nice but the game looked polished. Just needed to know what I should be doing and if I could die, could accomplish this with either audio voice over from a commanding officer or text. We cut it pretty close, and weren't able to add all the content we wanted (such is the nature of jams and all lol). What was left is a non hostile dungeon crawl. 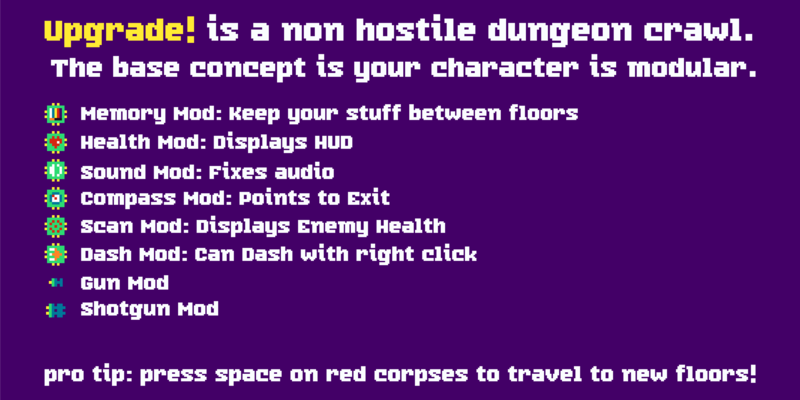 The base concept is your character is modular, and is testing components for dungeon crawling. We have updated the game page with a banner that explains all of the modules and what they do! You can die, but the only thing in the game that is deadly is the first boss (We intended for two more with increasing difficulty). Also if you press space on the red corpses they take you to the next floor. Well not knowing what to do with the red corpse, which looked like a popsicle is what stopped me. Got ya! Yea the bosses were going to have a whole animation and text pop ups and what not.